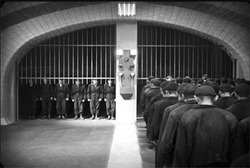 There must be many ardent admirers who know far more than me about Fritz Lang's "Metropolis" (1927), one of the great movies in the 20th Century. They will provide you more detailed and accurate knowledge about this unforgettable masterpiece after watching, no, experiencing it. So, I think I have to talk about my experience during the evening of May 4th and my several thoughts, instead of making a fool of myself by talking about what I do not know well. Like any other devoted movie lover, I was happy to hear about the miraculous discovery of the missing footage, thought to be lost forever, in last year. A nearly-completed print was found in Bueno Aires, Argentina, and it was confirmed by experts in Germany that it is genuine. This print was clumsily transferred to 16mm negatives after having arrived in Argentina and was in bad conditions, but the Murnau foundation began the restoration process based on this print as well as other prints discovered from Australia and New Zealand. In the end, the restored version was finally shown to people through the 60th Berlinale and other ways including Internet streaming in Germany early in this year. For me, it was pure luck to get the chance to see its glory. Very exhausted after a long returning travel from exhilarating Ebertfest in last month on April 27th, I came to know that the restored version would be shown in Jeonju International Film Festival. Jeonju is my hometown and I could not miss this great opportunity. Just like when I immediately grabbed the chance to watch Ramin Bahrani's "Goodbye Solo" during the same event of last year, I quickly went to the website of JIFF and there were few available seats for the first screening on May 4th(the second screening on May 5th had already been sold out). I immediately bought one seat for me. I would miss the family meeting because of that, but I think the movie is worthy of that sacrifice. To be frank with you, the situation was too fortunate for me to believe. I was a little worried while walking along the alleys of the festival place. What if the screening is canceled due to some sudden technical problems? I really want to thank my recent temporary depression. I had been plagued by the anomie resulted from returning to home after the trip, and I tried to get out of that state by prescribing myself with writings about my experiences in US and having a lot of rest for four days. My previous writings are the fruits of that treatment, and, thanks to that, I slipped into calm, meditative state like being on sedative; I was all-ready for accepting any disagreeable surprises with humility. Well, there was no problem in getting into the screening room. I took the reserved ticket from the booth without difficulty. Only thing I had to was walking down the alley I have known for nearly 20 years. I have walked around this alley since I was 9. I clearly remembered almost every movie I watched in this area during my childhood and teenager years and can tell you their loving or embarrassing memories. My first movie on this alley was "Batman Returns," "Bambi" of my childhood. I still like the movie while agreeing with Roger Ebert's opinion. It's too dark and neurotic and nihilistic as the superhero movie or the entertainment for children. But that movie used to inspire my night dreams with big, dark, pessimistic, but wondrous cities without brightness. 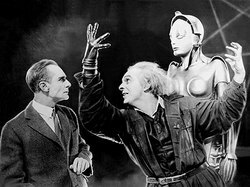 And think about the fact that all of those childish imaginations were basically originated from "Metropolis", which I would watch few minutes after in the same area. Come to think of it now, that seems like a perfect poetic ending, with beautiful lamps and red umbrellas hung under the darkening sky. 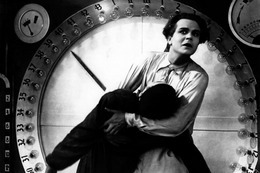 Certain anxiety took place few minutes before the show time: when was the last time I watched "Metropolis"? I cannot remember well. It was around 2004 or 2005, the wild time when I frantically engulfed lots of DVDs every week. It was the version released by Kino International I watched at that time, and it was certainly impressive than my first viewing from the pirate video with a tacky piano score. It was great to watch Kino version, but the memory was vague, and I was nervous because the comparison between Kino version and the restored version will be necessary when I write this. However, the memory was quickly freshened up as soon as the feature presentation starts and the great images were surfaced both on my memory bank and the screen. That immense, evocative city set which would influence many movies we're familiar with ("Blade Runner," "Brazil," "Batman," "Gattaca," "Dark City"....), the collage of relentless machines as dynamic as the sequences from "Man with a Movie Camera," the haunting entrance of beautiful Maria (Brigitte Helm) with poor kids at the Eternal Garden, the huge machine turned into the monstrous temple in the Freder(Alfred Abel)'s vision, Rotwang(sinister Rudolf Klein-Rogge) and his lair, underground workers gathering before Maria with heads down, the creation of False Maria by Rotwang, many faces and eyes on the screen, the climatic disruption of the city system and following deluge..... and the moving message about the heart as the mediator between the head and the hand. Like Joh Fredersen (Gustav Fröhlich), the domineering controller of the city and Freder's father, Lang wielded his directorial power with the crews and the actors and the extras more than 30,000 for completing his visions. In the era when people had never even dreamed of the computers, many sequences were made by hand-made special effects and they certainly look old-fashioned now. However, they are more absorbing than fast food CGIs nowadays; they make their own fantasies and we're attracted to them. The people on the movie were in the real situations where Lang mercilessly pushed them into, and that is certainly shown on the screen. Funny thing is, what Lang did is not far from what the Nazis did with the crowd in "Triumph of the Will" few years later. He was against the Nazis, unlike his wife at that time, so he fled from them and came to US, where his movies and other movies from the German Expressionism gave birth to another immortal style named Film Noir. 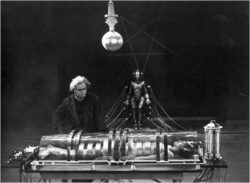 After the premiere, "Metropolis" went through terrible butchering process. Although the images still hold the power despite this atrocity, many have wished for its complete restoration. Until recent years, Kino version in 2002 is the most closest one to the original version. With Wagnerian original score by Gottfried Huppertz, it looks quite nice with several missing scenes described by intertitles. 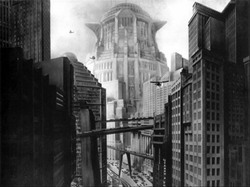 I want to emphasize this to you; the restored version of "Metropolis" is not complete. Due to the bad condition of found print, you can tell easily where the scenes or frames are added even if you're not a movie expert. About 8 minutes is still missing because of that, and one crucial scene between Fredersen and Rotwang is still explained by the intertitle. What the hell, the added materials indeed help the film a lot. Like Lang envisioned, the movie comes to us more than before as the fairy tale with the science filling the role of the magic(I was amused to spot the pentagram in Rotwang's house). Several supporting characters including Fredersen's assistant and Butler get more space and makes the story richer, although the story still lacks logic in some parts. The relationship between Fredersen and Rotwang becomes more interesting by watching their previously missing scenes. The characters of the movie are simple but their relationships are fascinatingly entangled, mainly by Rotwang's obsession and spite. With the hairdo of Doc Brown and the hand of Dr. Strangelove, Rotwang is the origin of all mad scientists , good or bad, in the movies to come. From the eerie sequence of his creation of false Maria, you will find familiar equipments and visual effects. Oh, by the way, he is a quintessential case of that famous Climbing Villain Syndrome from Ebert's Movie Glossary. I am always amazed by the power of the great silent movies. They don't talk to us, but they come to make voices in our head with our language despite their limits. Like Wall-E and Eve, the actors in the silent movies are more expressive with their faces than the mannequins we sometimes came across on the screen nowadays, and they surely stir our heart(Brigitte Helm is effective both as a graceful angel of hope and a sensual angel of destruction) The great images of "Metropolis" has made the striking impression on many of us with awe and still do. With added footage, the movie is a more moving drama now. And it has timeless aspects. While watching underground workers in "Metropolis", I was reminded of one article I read from local weekly magazines in last year. Written by the reporter who went to underground just like Freder, it told me there are still desperate people working mindlessly in a clockwork fashion in the factories. The task is pretty simple, but imagine you have to repeat it over and over and over again from AM 9:00 to PM 5:00 with few breaks. And the big cities continue to run above them while consuming them everyday - the replacements are always ready. This is not the reality only belonged to South Korea. Just look around, and you will see. 1) I told my far-flung correspondents friends during Ebertfest that the running time was about 3 hours, but the running time of the restoration version is 145 minutes with 24 frames per second. 2) I also criticized Gottfried Huppertz's score while not knowing it is the original score composed at that time. I respect the original score for keeping up with the grandiose visions on the screen, but it is sometimes too grand for intimate scenes between characters in the movie. Is it the problem with the orchestra, or do I demand a wrong thing to the silent movie score? Anyway, I and my friends predicted that Roger Ebert will probably show the movie to the audiences in Ebertfest of the next year. And we all agreed that the Alloy Orchestra, responsible for a fantastic experience during the showing of "Man with a Movie Camera" in this year, should be invited again if that happens. Ebert: You were right, and it will happen.